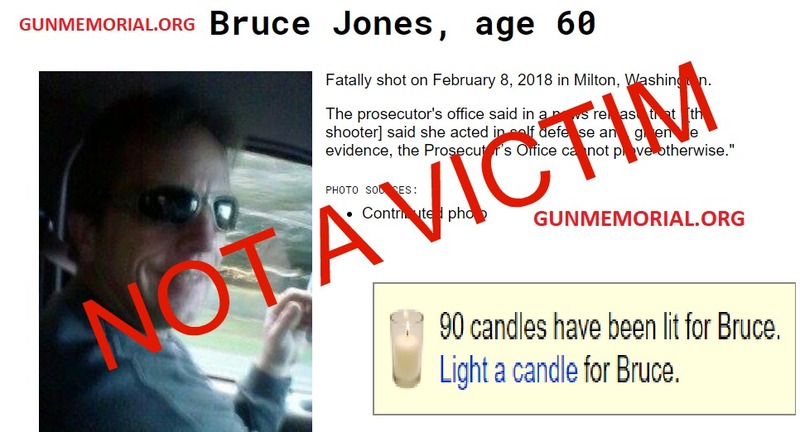 UPDATE: On Sunday evening, December 16th, the GunMemorial website quietly removed this perpetrator from their pages after receiving so much backlash from this article. Unfortunately, we have discovered thousands of other violent criminals who were killed in self defense on their site. We’ll be exposing some of the worst here soon. On February 8, 2018 a young woman shot and killed her attacker during a public road rage incident. 23 year old Aubrey Bowlin, was riding her motorcycle along I-5 in Milton, Washington when an irate driver began to act recklessly. According to witnesses, 60 year old Bruce Jones was distraught by the way Bowlin was driving her motorcycle. He boxed her into a location she could not drive away from. Jones exited his vehicle and physically attacked the young woman who was sitting on her bike. A fight followed, initiated by the much larger man. At one point, Bowlin head-butted Jones, who then drove Bowlin’s head into the jersey barrier before taking her to the ground. He hit her and shook her, she described, like a dog shaking a toy in its mouth. He violently tried to rip her helmet off and was choking her with the neck strap. She believed he was going to choke her to death. Bowlin shot Jones once in the chest when he attempted to climb on top of her. Jones died at the scene. No charges were filed and Bowlin was exonerated by the Pierce County Sheriff’s Department, as this was a clear case of self defense. Bowlin was a permitted concealed pistol carrier. She called 911 after ending the attack with her fatal shot, and waited at the scene. She did everything right, although according to her, she still suffers from PTSD. Seems like an open and shut case, right? Nope. It’s been discovered that the website gunmemorial.org, which puts up photos of people whose lives have been “lost to gun violence,” is memorializing this perpetrator as a “gun violence victim”. In fact, 90 virtual candles have been lit for him at the time of this writing. This is a man who nearly pummeled a 23 year old woman to death on the side of the interstate for the public to see. And he is being held up as the victim by the anti-gun community. It begs the question of how many other of these so-called “victims” are actually perpetrators. The anti-gun movement has adopted the term “homicide” when speaking of stats. But did you know homicide and murder are not the same? Homicide is all death except suicide – even justified deaths, such as those killed in self defense, as is the example here, as well as law enforcement related deaths. Murder is a malicious act with the intent to cause death (or serious harm resulting in death). Aubrey Bowlin could have been a murder victim, but she was not because instead she made Bruce Jones a homicide case. See how that works? With the ability to sway public opinion so easily by simply using a different word, it’s no wonder those who wish to to take away an individual’s right to self defense with a firearm would use the term homicide in their argument as it carries a much higher number. A number that portrays perpetrators as victims. It doesn’t take much digging into this Gun Memorial website to find their connection to the Gun Violence Archive – the website behind the widely spread number of 307 “mass shootings” in 2018 – a story we completely debunked after doing some serious research. (By the way, that real number is 6, not 307). Gun Violence Archive also makes a habit out of holding up violent criminals as victims – simply by using the word homicide. It seems like we can’t go a day without the media hyping up yet another story about yet another mass shooting. The media loves to make evil people famous. And when they start sharing numbers and stats about these shootings, a distracted populace believes them without question. On November 8, 2018 – the day after the heartbreaking Thousand Oaks shooting – Denver Channel 7, USA Today, Yahoo, and several other mainstream news outlets released articles claiming that there have been 307 mass shootings in the United States during 2018. 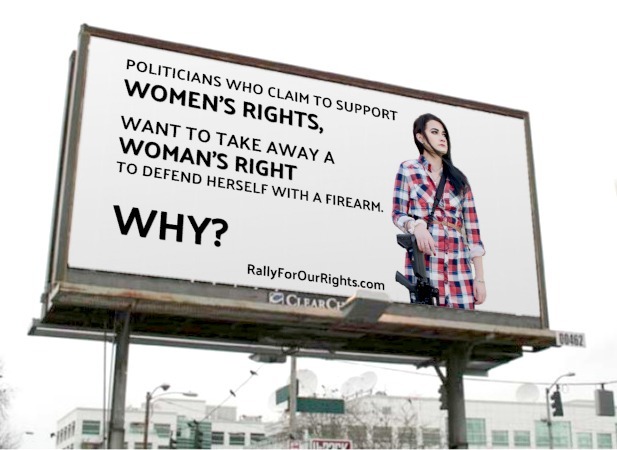 Rally for our Rights decided to look into this and what we found surprised even us. The American public is being grossly lied to – and they should care. In order to determine how many mass shootings there are, we need to know the definition of a mass shooting. Finding that definition seems easy enough, right? Think again. There are actually many definitions of “mass shooting” and most seem to be arbitrarily made up to fit the narrative an organization or publication wishes to push. Finally we come to the Congressional Research Service’s definition: “The incident takes place in a public area involving four or more deaths—not including the gunman, the shooter selects victims indiscriminately, the violence in these incidents are not a means to an end.” It should be noted that CRS breaks up shootings involving four or more individuals as public, familial, and felony (robbery, gang activity, etc). This is because the motives behind each vary greatly. To make matters even more confusing, the FBI has separate definitions for “mass murder” and “active shooter”. There are several inconsistencies between each of these definitions. For such a severe issue that allegedly only occurs in the United States, why do we not have a universal definition for this type of event? And why is it the government can agree on the definition, but the gun grabbers won’t use it? For the sake of this investigation, we used the definition put forth by the Congressional Research Service. The CRS’s website explains that it “works exclusively for the United States congress, providing policy and legal analysis to committees and members of both members of the house and senate, regardless of party affiliation.” The website further explains that the CRS is a “shared staff to congressional committees and members of congress. CRS experts assist at every stage of the legislative process.” To put it simply, congress uses the CRS’s research to develop policy and create laws. Now that we’re “armed” with the facts we need, lets dissect the statistics being pushed by the media. We dug into the website’s “mass shooting” report for 2018. We filtered the list by lowest deaths to highest. Immediately 11 out of the 13 pages were disqualified, as there were between 0 and 3 deaths per incident. That means right away, 287 incidents out of 307 do not qualify as a mass shooting by definition. In fact, 155 of these incidents resulted in zero deaths. This is unbelievable. That leaves only two pages to dig through. The most common theme with the remaining list of incidents is that they were primarily either family or domestic violence related. Using the definition used by the CRS, that removes all but six shootings that actually count as a public mass shooting. Yes folks, there have only been SIX mass shootings this year in the United States – not 307. February 14, 2018, Broward County Florida (Parkland), 17 dead, 17 injured. April 22, 2018, Antioch, Tennessee, 4 dead, 3 injured. May 18, 2018, Santa Fe Texas, 10 dead, 13 injured. June 28, 2018 Annapolis, Maryland, 5 dead, two injured. October 27, 2018, Pittsburgh, Pennsylvania, 11 dead, 7 injured. November 7, 2018, Thousand Oaks, California, 13 dead, 2 injured. Six mass shootings compared to 307 is a substantial difference. The media easily plays off the ignorance of the public, taking advantage of the fact that there is not a universal definition of “mass shooting”, and blowing up an issue that, although very tragic, is only part of a larger picture of violent crime, most of which does not involve firearms. This clearly shows that the media has a blatant disregard for the truth. They either have an ulterior motive in what they report, or they are too lazy to verify what is being given to them. It’s likely a bit of both, but the former is rather frightening. They are manipulating the general populace by creating hysteria through a skewed mass shooter narrative. This in turn will influence public opinion, and ultimately public policy. Rally for our Rights founder, Lesley Hollywood, released a poll on her Facebook page in coordination with this article. 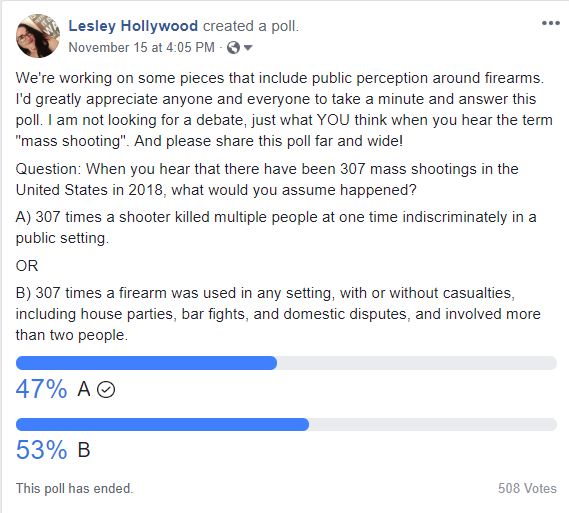 Lesley was curious what the general public thought had happened when they heard the term “mass shooting.” Out of 508 votes, nearly half of the individuals who participated thought a mass shooting was like what happened in Parkland, FL or Thousands Oaks, CA – not the definition being used by the Gun Violence Archive or many of the others. This manipulation of perception and public opinion will ultimately be used to conjure up reasons to demonize guns – portraying the objects as evil, with the means of using a lie to go after your ability and your right to keep your family safe and yourself safe. It also misses the mark terribly at addressing WHY these tragic incidents are happening, and how we can prevent them without infringing on the rights of the law abiding. *This article has been updated to include the Annapolis, MD incident on June 28, 2018.